The importance of wildlife corridors when dealing with conservation issues cannot be overlooked. In fragmented habitats like the ones present in India for the tiger, it is these corridors that facilitate animal movement and ensure a healthy flow of genes between forests. The more roads are built, the more forested land is sanctioned for mines and hydel power, the more corridors are lost. If economic development does not go hand-in-hand with environmental protection, hope for the tiger seems very grim. 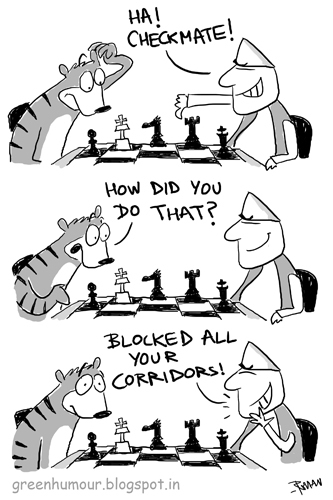 This cartoon has been published twice in the Tigerlink journal.